I just have a small bit of pink to show you. 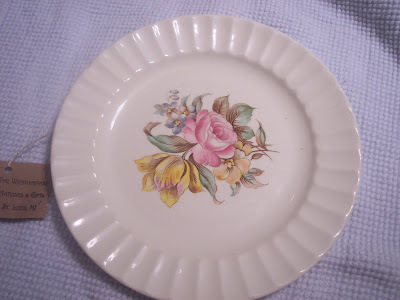 In the flower on this plate I picked up at an antique store. The plate was $2.00 and it has no markings on it what so ever. I just thought it would make a pretty plate to serve a dessert on. Now I realize you can go and buy a plate at Walmart for $2.00. 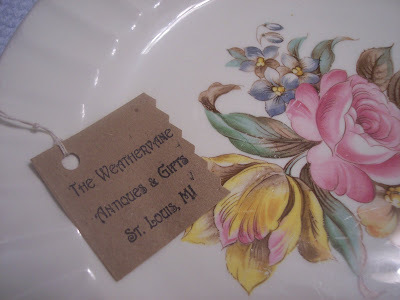 Or pick a plate up at a yardsale or thrifty store for .50 cents. So, this wasn't a "thrifty" purchase. It was just one lone plate with no markings on it. It was obviously loved by someone at one time because it is in wonderful condition. 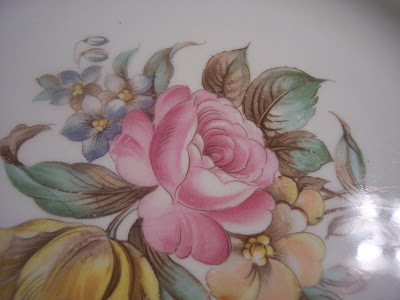 When I bought it, I thought that at sometime , in the past, a woman picked out this set of china or was given the set by someone close to her. She served her family their dinners on this set. Guests came to call and she brought the dishes out to serve a special dessert. That's what makes me want to buy the odd plate here and there. Someone has memories attached to this piece of china. I just went on the gliden site and the wrapper from the paint has to be postmarked by 10/16. It has to arrive there by 11/16, but must be sent by the 16. I didnt want anyone missing out because of dates. You and I think alike. When I see hand made crochet dollies, runners, bedspreads, etc. I always think...Someone made this with all the love and care in the world and it probably took them a long time to make. It should come home with me where it's going to be appreciated. Wow, finally someone that gets me. :-D Thank you so much for sharing. Have a great Pink Saturday. Lorri, Thanks for the heads up on my date error! I have changed the date on the post!